I wouldn’t normally post about a book that I didn’t finish reading, but considering the fact that I received not one but two free copies of California by Edan Lepucki – one from NetGalley, and one thanks to the Ford Audiobook Club on Goodreads – I feel as though I need to at least give my impressions of the five chapters I did manage to read. California got a lot of buzz when it first came out. The author appeared on The Colbert Report, and Colbert gave it a ringing endorsement. Bestseller status was a foregone conclusion. On top of all that, I tend to enjoy stories that play with the boundaries of genre storytelling, so I was definitely interested in picking up California when it came out. The basic premise of California focuses on a young couple, Cal and Frida, as they do their best to get by in the California countryside after American society collapses. When Frida discovers that she might be pregnant, the possibility throws everything about their lives into question. As soon as we got a copy of the audiobook, my girlfriend and I decided to listen to it during a weekend trip. We enjoyed it well enough, but after that trip I rarely found myself in the mood to keep listening. I eked out another hour or two over the next few months, but my interest in the book quickly waned and I finally decided to give up once I realized how long it had taken to read a measly five chapters. 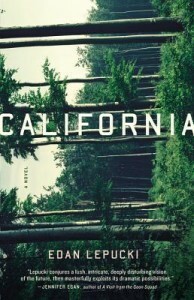 What I will say about the book is that the author’s portrayal of a doomed fear-future Los Angeles hits close to home. It doesn’t seem that far out of the realm of possibility now that I’ve lived in LA for more than a year. I was also slightly drawn to the book’s flashback scenes, which show how life in Los Angeles changed before Cal and Frida left for good. The problem with California is that it seemed like the most interesting story was happening in the past, and only by proxy. Most of the book’s present-day storyline focused on Cal and Frida worrying about the minutiae of getting by in the wilderness, which quickly wore out its welcome. Although there were hints of a bit more forward motion coming soon, I just couldn’t work up enough interest to keep listening. Additionally, so much time had passed since I’d started the book that it felt like I was just trying to force it by continuing to read. Maybe I’ll give California another shot some day, but it doesn’t seem likely. I’ve got several hundred other books in my queue, and they’re calling my name. Full disclosure: I received a free review copy of this book from NetGalley as well as a promotional copy from the Ford Audiobook Club on Goodreads.